I am excited! 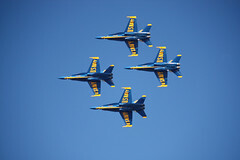 I am going to see the Blue Angels for the first time since I was a little kid. That's right people, it is air show weekend, my most favorite time of the year. I've been wondering the last few years if I am getting too old for the air show schedule that I set for myself. The idea of getting up early both Saturday and Sunday and spending 8-9 hours out there makes me tired. I'm not getting any younger you know! But the thought of missing even a moment of the air show or cutting back my schedule is unthinkable. And that air show excitement is starting to creep into my system as I see tweets about the Blue Angels practicing and I see photos like this one.